Mudhoney guitarist Steve Turner made a name for himself in the grunge explosion of Seattle. However, with his debut solo record, Searching for Melody, the Seattle-based troubadour wants to be known, at least somewhat (he hasn't abandoned Mudhoney), as a folk singer-songwriter. Or, folk-rocker, as it were, because Turner will never ditch his love of the rock, as Searching for Melody attests too. As much of a folk record as it is, Turner still implements a lot of rock, stretching the boundaries of what is folk, and what's not. From the contemplative "Living Through The Mistakes", a tried and true folk tune. The blues flavored "I Want You In My Arms". 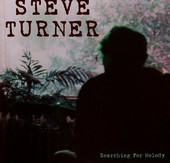 Or the rustic "You, My Girl", Turner doesn't stick with one sound, or within the confines of one genre, thus making Searching for Melody a country-folk-pop-rock record. If you were to combine all the elements, or the main elements, into a hyphenated description. But, what we really have here is a lyrically smart, rustic, home spun record of beauty and skill, a big leap away from Mudhoney, and a new direction that explores all of Turner's musical visions. I'll give it an A.